Liam wandered away on the evening of Christmas Eve. I can write those words calmly now, but when it happened, I will admit that I lost my cool. I did exactly what you should never do when you fear a beloved animal companion is lost: I panicked. I had opened the door simply to let Liam and his Springer sister, Tish, relieve themselves. They know the drill. Go out, do their thing, and come right back in, to be rewarded with a "cookie." But for whatever reason on this dark winter's night, Liam chose to mosey through the snow, deep into our wooded backyard, ignoring my gesticulations and verbal pleas to turn around and come back. The snow was several inches deep, and without boots, I couldn't follow him. But I couldn't take my eyes off him, either. I just stood there, powerless, as if watching a slow-motion movie. Liam kept sauntering away, literally deaf to what had become my screams, verging on hysteria: "Liam! Come back!" I ran back into the house, quickly slipped into my boots, and rushed outside again, now running frantically back and forth, pausing intermittently in the hopes of hearing the sound of Liam plodding through the snow. But all was silent, except for my racing heart. Tears streamed down my face as I rushed into the mud room and snapped a leash onto Tish's collar, thinking that maybe somehow, she'd be able to track Liam down. It was my only chance, at that point. 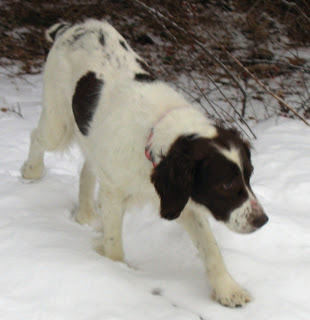 I feared that Liam would become confused in the thick woods behind the barn, or fall through thin ice in the frozen wetlands, and soon lose his bearings. "I'll never find him," I thought. "This can't be happening." With each passing minute, my hopes of ever finding Liam were diminishing, and I realized how inadequately I had prepared for something like this. Ever since Liam arrived, at the end of October, it had been my intention to forge a clear telepathic pathway between us, one that wouldn't need to rely on hand signals or facial expressions, but only on intention. We were beginning to develop a mutual understanding, but I wasn't sure if it was strong enough yet for me to be able to reel Liam back by using my heart's thoughts alone. As I stopped to ponder what to do next, I saw something moving, out of the corner of my eye. It was Liam! There he was, totally unruffled, calmly walking up the driveway as if nothing had ever happened. He had completed a 360 degree spin around the property while my mind had been running in circles. He seemed oblivious to the commotion, and wondered what the fuss was all about as I smothered him with hugs and kisses. In the moments before Liam reappeared, I realized how precious he has become to me, and how disconsolate I would be if I ever really lost him. And so our mission is clear: we'll work together to create our own "language," one based on our mutual affection, rather than on words or signs. I know we can do it, and I know we must do it. Liam's life might depend on it someday. SO grateful for the happy ending!